With all the recent media attention surrounding unpaid work schemes, it seems only fitting to discuss whether any job (paid or unpaid) is better than no job? 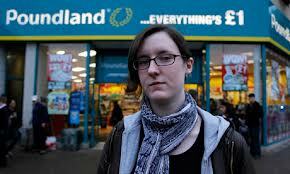 The well-publicised case of Cait Reilly (pictured), a geology graduate who was made to work for free in a Poundland store in order to receive her jobseekers allowance, even though she was already working free of charge in a museum to gain experience in a field she was interested in going into. Whilst it is understood that the scheme was introduced to show that jobseekers were willing to put themselves out, even if it meant working for free to secure a chance of a job, is it fair to take someone out of one unpaid relevant job just to take an irrelevant job that is specific to the scheme? Apparently not, the scheme was recently branded ‘unlawful’ in Cait’s case. In June last year an article by The Guardian revealed studentbeans.com findings that half of university students were willing to take on unpaid work in order to ‘kick start their career’. Furthermore, 40% said they would take a minimum wage position. With Graduates so willing to take on unpaid work, why should other job seekers not? In our current climatejobseekers must do whatever it takes to secure a job, and whilst it may be necessary to take unpaid work in order to gain experience, there must be safeguards in place to prevent companies exploiting jobseekers to solely get free labour. It seems sensible to have assurances or a quota that gives work placements participants a genuine chance of work at the end of the placement, but even more crucially, and what is overlooked often by many, being out of work can severely damage confidence and a negative working environment can have a detrimental impact on a job seekers confidence, and actually prove to be doing more harm than good. A chance to get back into the rhythm of working life is fantastic but not at the expense of effecting their future opportunities at longer term employment. If the government wish to see job seekers putting in effort in order to get a job, surely it is better for them to gain experience in a field they are actually interested in rather than one they will leave once their scheme finishes and end up in the same position as before? With recruiting companies being inundated with 100’s of applications for every role, a jobseeker’s experience is even more important to stand out, and having the right experience can be the difference to an employer that finds someone a job. It seems most people out of work are genuinely keen to get back into work, and while work placements can be a vital tool for many, there has to be a clear vision and understanding of the immediate next step that will actually benefits those looking for employment. This entry was posted in General Posts and tagged DWP, employment, job, jobcentreplus, landmark, law, poundland, work, workplace. Bookmark the permalink.